Check that quick-release levers are properly adjusted and tightened. Rotate the compression lever to the Open mode (fully counter-clockwise). If you have a Remote fork, set the fork to Open mode. Repeat steps 2-8 and recheck sag measurement. back it out (counter-clockwise) to the number of clicks shown in the table below. 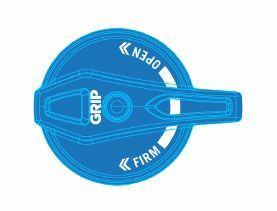 3-Position Lever: The 3-position lever is useful to make on-the-fly adjustments to control shock performance under significant changes in terrain, and is intended to be adjusted throughout the ride. You can use the OPEN mode during rough descending, the MEDIUM mode for undulating terrain, and the FIRM mode for smooth climbing. FOX recommends beginning with the 3-position lever in the open mode. *OPEN Mode Adjust: Open mode adjust is useful to control fork performance under rider weight shifts, G-outs, and slow inputs. 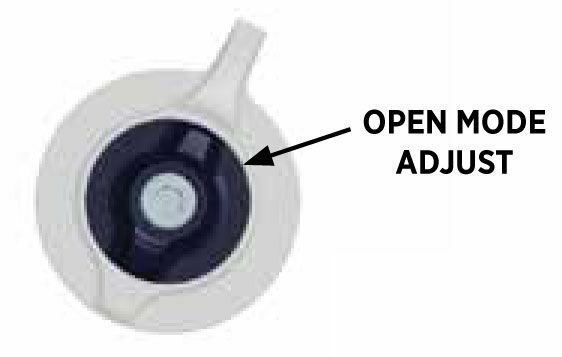 OPEN mode adjust provides 22 additional fine tuning adjustments for the OPEN mode. Setting 22 will have a more plush feel and setting 1 will have a firmer feel. FOX recommends beginning with the Open mode adjust set to 18 clicks out (counter-clockwise) from fully closed (clockwise). *Factory and Performance Elite Series forks only. 3-Position Micro Adjust: The 3-position lever is useful to make on-the-fly adjustments to control fork performance under significant changes in terrain, and is intended to be adjusted throughout the ride. Turning the lever to the full counter-clockwise position sets the fork in the Open mode. Turning the lever to the middle detent position sets the fork in the Medium mode. Turning the lever to the full clockwise position sets the fork in Firm mode. 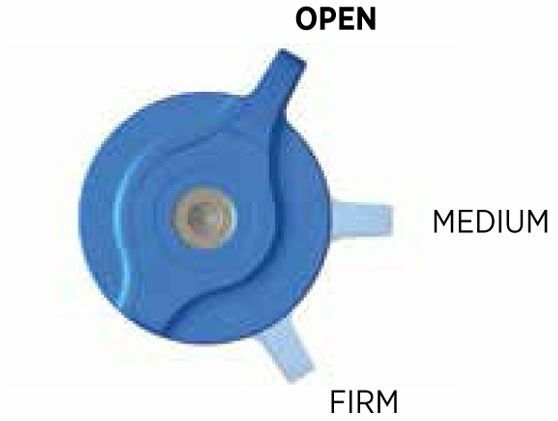 The positions between the Open, Medium, and Firm modes can be utilized to fine tune your compression damping. 2-Position Sweep Adjust (Rhythm Forks Only): The 2-position lever is useful to make on-the-fly adjustments to control fork performance under significant changes in terrain, and is intended to be adjusted throughout the ride. Turning the lever to the full counter-clockwise position sets the fork in the Open mode. Turning the lever to the full clockwise position sets the fork in Firm mode. 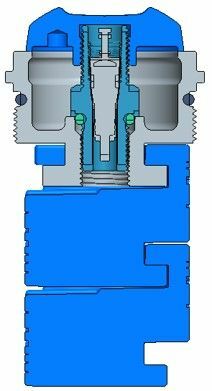 The positions between the Open and Firm modes can be utilized to fine tune your compression damping. FOX recommends beginning with the 2-position lever in the Open mode. The 2-Position remote can either be installed under the handlebar on the non-drive side, where a front shifter would typically be placed, or installed above the handlebar on the drive side. 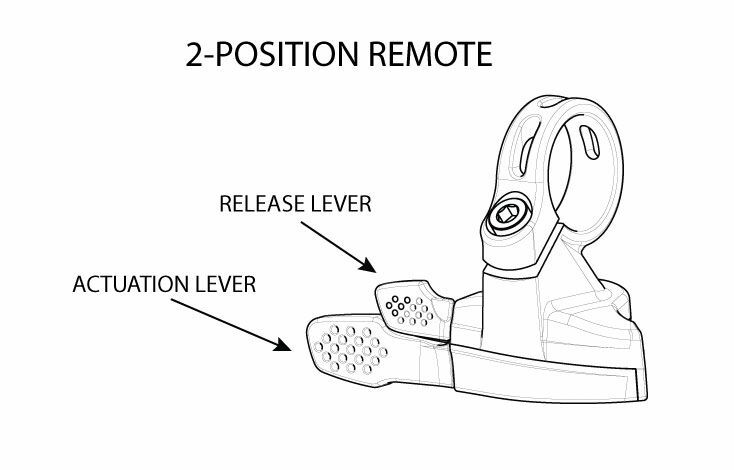 The 2-Position remote can be used with two cables to control both Push-to-Unlock forks and shocks simultaneously. The 3-Position remote can be installed in-line with the handlebar on either side and can control the fork or shock. Install the remote lever onto your handlebar. Do not exceed 1.7 Nm (15 in-lb). Less torque may be needed for carbon bars. Refer to the handlebar manufacturer’s instructions for use with carbon bars. Make sure to check for clearance between the remote lever and any brake or shifter controls. For Push-to-Lock forks only - route the cable housing from the remote lever, around the rear of the crown, to the fork topcap cable stop and cut to length. Install a ferrule on the remote end. For Push-to-Unlock forks only – route the cable housing from the remote lever, across the front of the crown, to the fork topcap cable stop and cut to length. Install ferrules on both ends. Set the remote lever to OPEN mode by pushing the release lever. Make sure that the cable head is completely seated in the remote lever. For 2-Position remotes only - use a short piece of housing with one ferrule between the in-line barrel adjuster and the remote lever body. With all cable housing fully seated and no slack in the system, lightly lubricate the inner cable and thread it through the cable housing and around the fork remote pulley. While holding the cable tight, tighten the pinch bolt, cut off excess cable, and crimp the end. Route the cable housing from the fork topcap, around the rear of the crown, to the remote lever and cut to length. Install a ferrule on the end of the housing at the remote lever. The end of the housing at the fork topcap does not require a ferrule. Set the remote lever to FIRM mode by pushing the actuation lever. Make sure that the cable head is completely seated in the remote lever. Use a 5 mm hex wrench to turn the remote pulley clockwise until you feel it lightly stop, then hold it in place. For forks with the cable exiting the topcap at the rider’s 1 o’clock position: the remote pulley should stop at the 10-11 o’clock position. For forks with the cable exiting the topcap at the rider’s 7 o’clock position: the remote pulley should stop at the 4-5 o’clock position. With all cable housing fully seated and no slack in the system, lightly lubricate the inner cable and thread it through the cable housing and around the fork remote pulley. While gently holding the remote pulley against the clockwise stop with your 5 mm hex wrench, tighten the pinch bolt. Release the 5 mm hex wrench from the remote pulley, cut off the excess inner cable, and crimp the end. 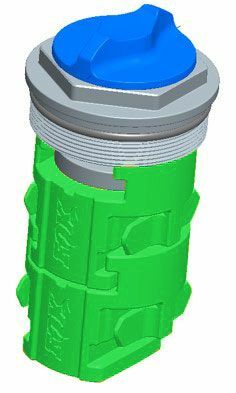 The in-line barrel adjuster may be used to change the lockout blow-off force. Clockwise barrel adjustment increases blow-off force, while counter-clockwise adjustment decreases blow-off force. The 2-position remote is designed to be used in place of a front shifter, under the handlebar on the rider's left side. The 2-position remote can be used with 2 cables to control both the front fork and rear shock simultaneously. The 2-Position Remote lets you to switch between the OPEN and FIRM modes while riding. 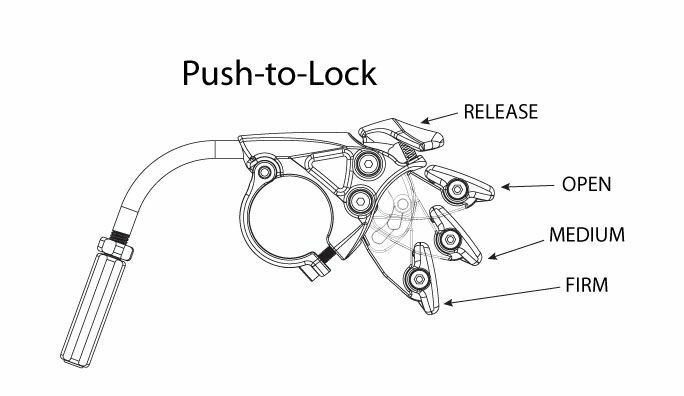 Push-to-Lock – Push the actuation lever to set the fork to FIRM mode. Push the release lever to set the fork to OPEN mode. 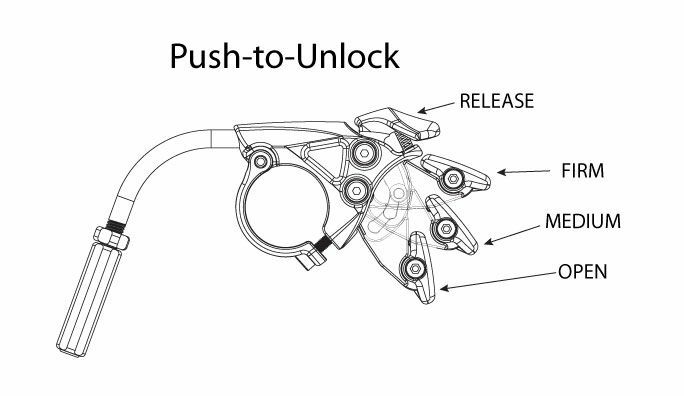 Push-to-Unlock – Push the actuation lever to set the fork to OPEN mode. Push the release lever to set the fork to FIRM mode. The 3-Position Remote lets you to switch between the OPEN, MEDIUM, and FIRM modes while riding. Push-to-Lock – Push the actuation lever down one click to set the fork to MEDIUM mode. Push the actuation lever down again to the lowest position to set the fork to FIRM mode. Push the release lever to set the fork to OPEN mode. Push-to-Unlock – Push the actuation lever down one click to set the fork to MEDIUM mode. Push the actuation lever down again to the lowest position to set the fork to OPEN mode. Push the release lever to set the fork to FIRM mode. 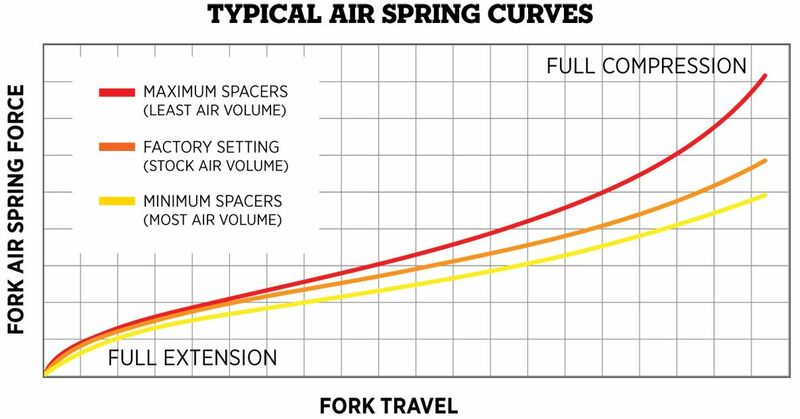 Changing volume spacers in the 32/34 FLOAT and RHYTHM forks is an easy internal adjustment that allows you to change the amount of mid stroke and bottom out resistance. 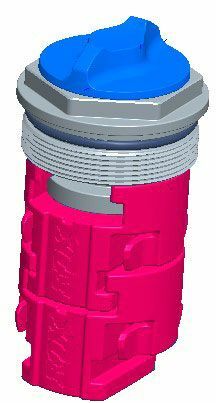 Some 32mm FLOAT forks come with a factory installed hollow volume spacer pictured below. Standard blue 32mm volume spacers can be added to the hollow volume spacer to further reduce air volume if desired.